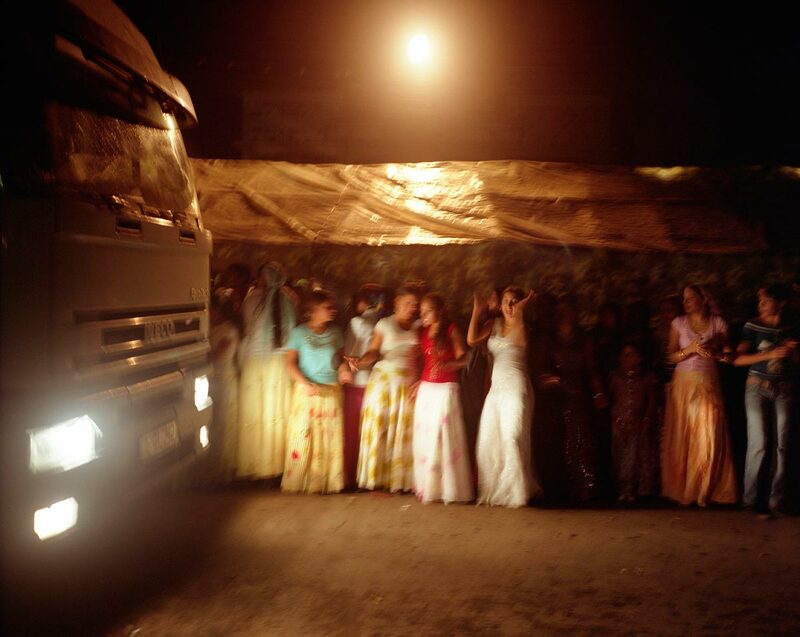 Roma girls dance in the street, illuminated only by a passing truck, on the day of 14 year old Garoafa Mihai's wedding to 13 year old Florin 'Ciprian' Lulu, in the village of Sintesti, in Romania, Sunday, Sept. 24, 2006. For the wedding 100 pigs, costing approximately 30,000 USD, were slaughtered. Garoafa wore a gold "salbe"- a necklace of gold Franz Josef coins, worth an estimated 30,000 USD. The Kalderari roma of Sintesti are by tradition metal workers, originally making alcohol stills, pots and pans, but now dealing in scrap metal. The large profits from their business have enabled them to build large houses in the village of Sintesti, 20km from Bucharest, and to invest in fast, Western brand name cars such as BMW's, Mercedes and Porsche.